Several weeks into the summer, Harry Potter has heard nothing from his friends or acquaintances from the wizard world. Finding himself walking down a street with his cousin Dudley, the two of them are attacked by a pair of Dementors. Harry drives them off with a Patronus Charm, and is surprised to learn that the Dursleys' elderly next-door neighbour Arabella Figg, is a Squib and has been keeping an eye on him on Albus Dumbledore’s orders. On returning home, he immediately receives a notice of expulsion from Hogwarts for using magic outside school. One night, an advance guard from the Order of the Phoenix arrives at the house and escorts Harry to their secret headquarters at Number Twelve, Grimmauld Place in London, where Harry joins the Weasley family, Hermione Granger, and Harry’s godfather Sirius Black. They tell him that Voldemort is building an army and is attempting to retrieve a "weapon," but is still moving in secret. In this, he is actually aided by the Ministry, since Minister Cornelius Fudge is conducting an extensive smear campaign against Harry, Dumbledore, and anyone else that says Voldemort's back. Knowing that Voldemort’s return would mean mass panic and then open war, Fudge prefers to listen to his paranoia and believe that Dumbledore is lying and attempting to supplant him as Minister. A few days later, Arthur Weasley escorts Harry to his expulsion hearing, which Fudge has done everything in his power to slant against him, but testimony from Dumbledore and Mrs Figg confirms the presence of the Dementors, and Harry is found to have acted in self-defence. Shortly before returning to Hogwarts, Harry is surprised and a little disappointed when Ron and Hermione, but not he, are made prefects of Gryffindor House..
Joanne Rowling was born in South Gloucestershire, England on 31 July 1965, on the outskirts of Bristol. There is some confusion as to exactly where; Rowling has said she was born in Chipping Sodbury, whereas her birth certificate apparently claims she was born in the Cottage Hospital at Yate. Her sister Di was born when Rowling was almost two . The family moved to Winterbourne, Bristol when Rowling was four, and then to Tutshill, near Chepstow, Wales at the age of nine. She attended secondary school at Wyedean School and College. In December 1990, Rowling's mother succumbed to a decade-long battle with multiple sclerosis. After studying French and Classics at the University of Exeter, with a year of study in Paris, she moved to London to work as a researcher and bilingual secretary for Amnesty International. During this period she had the idea for a story of a young boy attending a school of wizardry while she was on a four-hour, delayed train trip between Manchester and London. When she had reached her destination, she began writing immediately . Rowling then moved to Portugal to teach English as a foreign language. While there, she married Portuguese television journalist Jorge Arantes on 16 October 1992. They had one child, Jessica Isabel, before divorcing in 1993. Their daughter was named after Rowling's heroine, Jessica Mitford. In December, 1994, she and her daughter moved to be near her sister in Edinburgh. Unemployed and living on state benefits, she completed her first novel, doing some of the work in local Edinburgh cafes whenever she could get Jessica to fall asleep. There was a rumour that she wrote in local cafés in order to escape from her unheated flat, but in a 2001 BBC interview Rowling remarked, "I am not stupid enough to rent an unheated flat, in Edinburgh, in mid-winter; it had heating"
In 1995, Rowling completed her manuscript for Harry Potter and the Philosopher's Stone on an old manual typewriter. Upon the enthusiastic response of Bryony Evans, a young reader who had been asked to review the book's first three chapters, the Fulham-based Christopher Little Literary Agents agreed to represent Rowling in her quest for a publisher. The book was handed to twelve publishing houses, all of which rejected it. . A year later she was finally given the greenlight (and a £1500 advance) by the editor Barry Cunningham from the small publisher Bloomsbury. Although Cunningham happily agreed to publish the book, he claims he advised her to get a day job, as she had little chance of making money in children's books. She then received an £8000 grant from the Scottish Arts Council to enable her to continue writing. 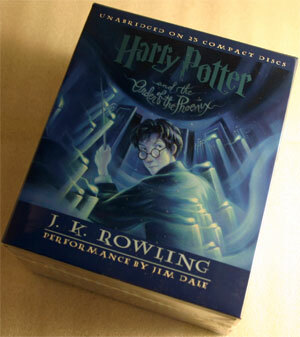 The following spring, an auction was held in the United States for the rights to publish the novel, and was won by Scholastic Inc, who paid Rowling more than 0,000. Rowling has said she "nearly died" when she heard the news. In June, 1997, Bloomsbury published Philosopher's Stone with an intial print run of only 1000 copies, 500 of which were distributed to libraries. Today, such copies are valued at between £16,000 and £25,000 each. Five months later it won its first award, a Nestle Smarties Book Prize. In February, the novel won the prestigious British Book Award for Children's Book of the Year, and, later the Children's Book Award. In October 1998, Scholastic published Philosopher's Stone in the States under the title of Harry Potter and the Sorcerer's Stone, a change Rowling now claims she regrets and would have fought if she had been in a better position at the time. . In December 1999, the third Harry Potter novel, Harry Potter and the Prisoner of Azkaban,won the Smarties Prize, in the process making Rowling the first person to win the award three times running. She later withdrew the fourth Harry Potter novel from contention to allow other books a fair chance. In January, 2000, Prisoner of Azkaban won the inaugural Whitbread Children's Book of the Year award, though it narrowly lost the Book of the Year prize to Seamus Heaney's translation of Beowulf. That June, the Queen honored Rowling by making her an Officer of the Order of the British Empire. Rowling has stated that she plans to continue writing after the publication of the final Harry Potter book, Harry Potter and the Deathly Hallows, In an interview with Stephen Fry in 2005, Rowling claimed that she would much prefer to write any subsequent books under a pseudonym; however she conceded to Jeremy Paxman in 2003 that if she did, the press would probably "find out in seconds." In 2006, Rowling revealed that she had finished writing a few short stories and another children's book (a "political fairy story") about a monster, aimed at a younger audience than Harry Potter readers. She is not planning to write an eighth Harry Potter book, and has stated, "I can't say I'll never write another book about that world just because I think, what do I know, in ten years' time I might want to return to it but I think it's unlikely." However, Rowling has said she will be writing an encyclopaedia of Harry Potter's wizarding world consisting of various unpublished material and notes. Any profits from such a book would be given to charity. During a news conference at Hollywood's Kodak Theatre in 2007, Rowling, when asked how the encyclopaedia was coming along, said, "It's not coming along, and I haven't started writing it. I never said it was the next thing I'd do." As of the end of 2007, Rowling has said that the encyclopaedia could take up to ten years to complete, stating "There is no point in doing it unless it is amazing. The last thing I want to do is to rush ­something out". In July 2007, Rowling said that she wants to dedicate "lots" of her time to her family, but is currently "sort of writing two things", one for children and the other for adults. She did not give any details about the two projects but did state that she was excited because the two book situation reminded her of writing the Philosopher's Stone, explaining how she was then writing two books until Harry took over. She stated in October 2007 that her future work was unlikely to be in the fantasy genre, explaining, "I think probably I've done my fantasy....it would be incredibly difficult to go out and create another world that didn't in some way overlap with Harry's or maybe borrow a little too much from Harry." In November 2007, Rowling said that she was working on another book, a "half-finished book for children that I think will probably be the next thing I publish." In March 2008, Rowling confirmed that her "political fairy tale" for children was nearing completion.